“Your horse won’t eat any oats, nor will he be bled until I get my revenge” threatens his lady Orgeuilleux de la Lande, making his displeasure evident by abusing the lady’s horse. Horses were vital agents in daily life throughout the medieval period, but with the advent of technology in the twentieth century, they have been somehow marginalized in academic studies. Recently, interest in equine history has surged, but there are still many issues waiting to be tackled by scholars. If you would like to propose a theme that does not fit in the above categories, please contact the organizers. Paper abstracts (up to 500 words) and short biographies (up to 100 words) are to be sent to Dr Anastasija Ropa (Anastasija.Ropa@lspa.lv) and Dr Timothy Dawson (levantia@hotmail.com) by 31 August 2018. Publication of selected papers is planned. If you would like to be involved in organizing the sessions or editing or reviewing the publication, please contact the organizers (Anastasija.Ropa@lspa.lv, levantia@hotmail.com). What got you in to history? horse history? My love for history and horses has been intertwined for as long as I can remember. I’ve loved horses since about age 2… there seems to be no rhyme or reason for this passion (i.e. no one else in my family rides), and family members joke that “horses are in my blood.” At a young age I developed a love for the medieval period facilitated by reading early Irish, English and Norse myths and legends, learning about knights and medieval warfare and my dad bringing me on trips to the Metropolitan Museum of Art and the Cloisters in NYC. My doctoral research focused on law and administration in late Anglo-Saxon England. My monograph, The Reeve in Late Anglo-Saxon England is in submission with Boydell and Brewer Ltd (forthcoming 2019). In my study of the reeve as an estate manager, I have come across interesting sources on the horse and horse management in late Anglo-Saxon England, which is a project I am also currently researching. Additional research interests include Anglo-Saxon diplomatic, law and administration, Anglo-Saxon culture and prosopography, the horse in antiquity and the Middle Ages, medieval urban history, environmental history of the West from Antiquity through the Middle Ages, the Crusades, Roman Britain and Roman history and literature. I’ve ridden since age 7 and have done dressage exclusively since about age 15. My love of and interest in dressage was in part sparked by reading Xenophon and learning about Classical and Medieval training of war horses. I have had my current equine partner (and best friend), an Appaloosa gelding named Goodnight Moon, since I was 15 and he was 5. Chelsea Shields-Más will be presenting “If Wishes were Horses: Building a Picture of Late Anglo-Saxon Equine Management and Care” at our inaugural conference. 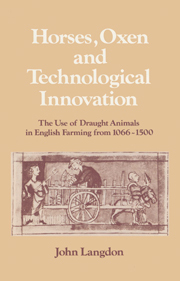 John Langdon, Horses, Oxen and Technological Innovation: The Use of Draught Animals in English Farming from 1066 to 1500 (Cambridge: Cambridge University Press, 1986). Now more than thirty years old, John Langdon’s Horses, Oxen and Technological Innovation: The Use of Draught Animals in English Farming from 1066 to 1500, still stands as not only one of the most influential historical monographs about horses, but also as a broad window into the economy and society of medieval England. Langdon’s foray into the world of medieval horses was not through any of the ‘usual’ channels, as he was neither an historian nor an equine enthusiast. Originally trained as a chemical engineer, Langdon abruptly changed careers in his late thirties, moved to England and tried his hand at writing novels. In the course of writing two books set in the Middle Ages, he developed a taste for research and enrolled in the history PhD program at the University of Birmingham. It was at this point that he discovered a significant gap in the historiography of the medieval English economy: scholars such as Lynn White Jr. had long argued for the theoretical advantages that working horses held over oxen, but this had yet to be tested on any scale with historical evidence. In addition, there was still a strong contingent of historians who claimed that the introduction of the horse to English agriculture was basically irrelevant. So, Langdon set out to basically count the numbers of horses and oxen in England from Domesday Book in 1086 to the dawn of the early modern period. Langdon’s background as an engineer allowed him to tackle this question with a method relatively novel to the field of medieval history at the time. Most economic and social studies of the medieval period were focused relatively narrowly in time and/or space. Some studies would look at a single manor over a long period of time, others would focus on a broader region, or even the whole country, but at a single point, like the Norman invasion in 1066 or the Black Death in 1348. Langdon endeavoured to take a national data sample that covered as much of medieval England as possible and to do this for most of the Middle Ages. Looking back on this from 2018, the amount of work required to assemble his data sample is impressive. This was before the technological advents of digital photography or even Excel spreadsheets. Langdon travelled around the country painstakingly reading medieval Latin manuscripts and tabulating the numbers of horses and oxen by hand. The results were impressive. Langdon looked closely at the numbers of oxen and horses employed on both demesnes (the lord’s own farm with the manor, as opposed to the lands allocated to his or her peasant tenants) and peasant farms in medieval England. He found that, between the Domesday survey of 1086 and the end of his study in 1500, horses had largely superseded oxen as the choice for animal power both on the roads (as cart animals) and in the fields (as plough beasts). The proportion of working horses increased from about 30 percent in 1086 to over sixty percent by 1500. So, before 1200, oxen were the dominant work animals, and source of kinetic energy, on both farms and roads in England. By the sixteenth century, however, horses had achieved almost total ubiquity in the world of work animals. This had critical implications for the economy of medieval England, as the speed advantage of horses over oxen allowed more work to be done in less time. Horses offered significant premiums over oxen in terms of both speed and power which, in turn, had critical implications for agricultural production, transport and market transactions. The introduction of working horses allowed goods to be transported with greater efficiency while also helping improve agricultural output through increasing the speed at which essential tasks such as ploughing and harrowing could be completed. Improvement across all of these areas, facilitated by the introduction of working horses, was a key ingredient of England’s economic development. Langdon also found that the change from oxen to horses was not uniform. Especially in the case of plough animals, for example, Norfolk, the Chiltern Hills and eastern Kent embraced all-horse plough teams earlier than any other part of the country. Also, while horses were increasingly employed in tandem with oxen in the midlands and the home counties over the course of the thirteenth and fourteenth centuries, many demesnes, especially in the West and North, never made the change and stuck exclusively with oxen for plough work. His long durée approach allows readers to appreciate how the evolving dynamic between horses and oxen existed not in a vacuum, but as one consideration that depended greatly on regional topographies, managerial mentalities and a host of other variables. As Joan Thirsk had done before him, Langdon likened the medieval horse trade to the more modern car trade; with horses available at almost any price point. With this wide range in prices, cheap draught animals were made available to peasants just as the lower-end used car market does for lower-income people today. This led to another key finding: in medieval England, horses were very much a peasants’ animal. While horses had been expensive and prestigious beasts in the Anglo Saxon world, the taboo of eating horse flesh in England meant that older horses, perhaps nearing the end of their productive working lives, had very little market value. As they could not be fattened and sold for meat, an older horse was basically only worth the few pennies that could be fetched for its hide. However, for less demanding work on a small peasant farm, an older horse could be bought for little money and used for a number of years. The wide adoption of horse power by peasants did much to increase the area in which goods could be both bought and sold, allowing individuals access to previously inaccessible markets and thereby increasing the integration of previously disparate locales. Alongside water and wind power, working animals were one of three essential sources of energy in the medieval economy. By understanding how England was furnished with this power, Langdon helped unlock key insights into how the medieval economy was able to grow during the crucial period of England’s, and indeed Europe’s, demographic and economic development from ca. 1250 to ca. 1350. The Veterinary Medicine Historical Collection at Michigan State University contains bountiful resources for anyone interested in the history of equine medicine, along with veterinary medicine in general. The collection includes over 1,400 manuscripts and books, dating as far back as the fifteenth century, making it one of the largest collections of its kind in the United States. The first illustrated edition of Marcus Fugger’s Von der Gestüterey (1584), on horse breeding. The Veterinary Medicine Historical Collection is housed in MSU’s Special Collections, recently renovated and in the main library on campus. A partial catalogue of the Collection is available online, also available in PDF form; for all holdings, see the MSU Library Catalogue. It is possible to register and request works to examine before your visit. They are open nearly every day of the week during the academic year. The Compleat Horse Doctor, 17__? During the month of April, the Equine History Collective will be featuring posts related to the history of veterinary medicine. If you are interested in submitting a book review, let us know at equinehistory@gmail.com. The bibliography below lists recent histories of veterinary medicine in English, with a focus on works at least partially devoted to equids. The list is by no means exhaustive, so if you have found certain books or articles to be especially helpful (including those in other languages), please add your comments below! Adams, J. N. Pelagonius and Latin Veterinary Terminology in the Roman Empire. Leiden: Brill, 1995. Alkhateeb Shehada, Housni. “Donkeys and Mules in Arabic Veterinary Sources from the Mamlūk Period (7th–10th/13th–16thCentury).” Al-Masaq 20, no. 2 (September 2008): 207–214. https://doi.org/10.1080/09503110802283424. ———. Mamluks and Animals: Veterinary Medicine in Medieval Islam. Leiden: Brill, 2012. Brown, Karen and Daniel Gilfoyle, eds. Healing the Herds: Disease, Livestock Economies, and the Globalization of Veterinary Medicine. Athens, Ohio: Ohio University Press, 2010. Buell, Paul D., Timothy May, and David Ramey. “Greek and Chinese Horse Medicine: Déjà vu All Over Again.” Sudhoffs Archiv 94, no. 1 (2010): 31–56. http://www.jstor.org/stable/20778426. Curth, Louise Hill. The Care of Brute Beasts: A Social and Cultural Study of Veterinary Medicine in Early Modern England. Leiden: Brill, 2010. ———. ‘A plaine and easie waie to remedie a horse’: Equine Medicine in Early Modern England. Leiden: Brill, 2013. Jones, Susan D. Valuing Animals: Veterinarians and their Patients in Modern America. Baltimore: Johns Hopkins University Press, 2003. McCabe, Anne. A Byzantine Encyclopedia of Horse Medicine: The Sources, Compilation, and Transmission of the Hippiatrica. Oxford: Oxford University Press, 2007. Michell, A. R., ed. History of the Healing Professions: Parallels between Veterinary and Medical History. Vol. 3 of The Advancement of Veterinary Science: The Bicentenary Symposium Series, edited by A. R. Michell. Wallingford: CAB International, 1993. Mishra, Saurabh. Beastly Encounters of the Raj: Livelihoods, Livestock and Veterinary Health in North India, 1790–1920. Manchester: Manchester University Press, 2015. Mitsuda, Tatsuya. “Entangled Histories: German Veterinary Medicine, c.1770–1900.” Medical History 61, no. 1 (January 2017): 25–47. https://doi.org/10.1017/mdh.2016.99. Woods, Abigail. “From One Medicine to Two: The Evolving Relationship between Human and Veterinary Medicine in England, 1791–1835.” Bulletin of the History of Medicine 91, no. 3 (Fall 2017): 494–523. https://doi.org/10.1353/bhm.2017.0058. Woods, Abigail and Stephen Matthews. “‘Little, if at all, Removed from the Illiterate Farrier or Cow-leech’: The English Veterinary Surgeon, c1860–1885, and the Campaign for Veterinary Reform.” Medical History 54, no. 1 (January 2010): 29–54. https://doi.org/10.1017/S0025727300004300. It probably suffices to say that my role models as young adolescent were Tolkien’s riders of Rohan and Dumas’s musketeers… As a postgraduate, my principal research interest was medieval literature, and especially Arthurian romance, while horses were my private passion. A natural step forward after completing the PhD was to combine the two. Eclipse: his is a fairy-tale scenario of a horse who was deemed unfit for sport by his contemporaries and retired from racing an unbeaten champion. Eclipse went on to become a prize breeding stallion, so most of today’s Thoroughbreds – including my own ex-racing horse – are his descendants. A lot of diverse projects, mainly to do with the Middle Ages. I am involved in organizing sessions on the medieval horse at the International Medieval Congress in Leeds, and related activities. I am also preparing articles on the prices of medieval horses and horse welfare in the Middle Ages. I am currently on maternity leave, with fewer opportunities to ride, but, in the summer, I will resume training horses, which gives me an opportunity to gather empirical evidence for my long-term project on medieval horse training. Anastasija is the organizer of the “Equestrianism” strands at IMC Leeds and several other equine history projects. She is currently a lecturer of English and translator at the Latvian Academy of Sports Education. Find her here. John Clark is a curator (now Emeritus) at the Museum of London, and as such his book The Medieval Horse and Its Equipment is primarily focused on objects on display at the museum, which are themselves primarily English in origin. What sets Clark’s book apart from similar catalogs is his in-depth analysis of each object. Rather than just the little “where and when” blurb found on each items placard, Clark gives a full account of how each item was found; how it was used; and what implications the usage, motifs, or material have. He also shows examples, where available, of each item in art contemporary to itself, and relates it all to current scholarship. John Clark applies in this way the research of not only Ann Hyland and R.H.C. Davis, the major authors on medieval equines, but also of dozens of scholars in art, archeology, agricultural and military history. Because many of the smaller items, such as bits and horse shoes, were found in archeological digs, Clark provides diagrams of the most important sites. With the long and complicated history of horses in England, these help illustrate which items are Roman in origin, which are Saxon, etc. In addition to the assorted bits, spurs, brushes, shoes, and other equine implements, Clark also presents equine skeletons found at theses digs. These corroborate his own and Ann Hyland’s theories regarding the size of the animal that would have worn the shoes, bits, and armor we have available for measurement. Because the size of the medieval “Great Horse” has been the subject of debate for much of the past century, Clark opens his book with this skeletal evidence, and a long historiography on the topic. Clark is very meticulous in all of his reports, and these skeletons are no different. He gives the location where they were found, not only geographically but also whether it was a burial, a trash heap, or a butchers yard. He provides the approximate date they were buried (or otherwise disposed of); and he notes the measurements and what marks the bones carried, such as injuries from weapons, marks of butchery, or “pathologies indicating stress on the joints and back.” Those with weapons marks, of course, are used to support the idea of a much smaller “Great Horse” than that supposed by Davis and other early scholars. He largely omits the “stirrup controversy,” but that is somewhat outside the scope of this work. Clark also uses the skeletal evidence to touch on a second highly debated topic, hippophagia. By noting the complete absence of butchery marks on horses found in dump sites near London later in the period, Clark can suggest that by the 14th century butchers were not taking old horses for meat near London. Finds further from the city did have butcher marks, but Clark does not posit a theory for these. In sum, this book is invaluable in providing careful analysis alongside archeological and material evidence. John Clark also presented this past year at IMC Leeds on “The Development of Bits from the Viking Age to the 16th Century, in England and Beyond,” and we look forward to his chapter forthcoming on this topic.